I thought I would share this article by a Vermont potter. He shares his thoughts about well crafted pots and more. A couple of days ago, I threw twelve mugs. After I pulled and attached a handle to each one, I lined them up on a board and then stepped back and looked. They were each made with exactly a pound of clay, about five inches tall and had a flaring cylindrical shape. They were similar, but different as sets of thrown pots can be. I’ve been experimenting lately with some different mug forms in search of the right one and a cylinder that flares just a bit at the rim is the one for now. They looked okay with consistent wall thickness, flat bottom, smooth rim and appropriately attached handle. At the same time, as I studied the mugs, I wondered if their form was unique enough or were they just like all the others. If someone, someday, looks at one of the mugs, will they realize the mug was made by me without turning it over? My mug musings brought me back to my first year in college in 1971 and a debate about form, style and technique. I was sitting with other ceramics majors in one of my first classes and after being prompted by Hobart Cowles, our professor, we started talking about the difference between art and craft. Most of us fledgling potters felt we were more craftsmen than artists while some argued the lines between the two were less crisp. That led to a discussion that eventually morphed into a debate about style and form versus technique and the utility of an object. It was at that point when Hobart got up, went to the chalkboard and wrote the phrase, “Form follows function”. I’m not sure the quote changed the minds of all those who argued that we were every bit the artists as our classmates upstairs in the fine arts department, but it did add a considerable amount of weight to the argument for the rest of us who embraced being craftsmen. It actually was an architect, Louis Sullivan, who is credited with the phrase that Hobart scribbled on the board. In talking about good building design in the late 1800s, he suggested that structures must exhibit the three qualities of “firmitas, utilitas, venustas” meaning solid, useful, and beautiful. What’s interesting is Sullivan actually wrote that “form ever follows function”, but a version minus “ever” is typically what is quoted. The two phrases, although similar, are slightly different. That said, Sullivan’s quote offers support to the notion that form is not unimportant, but it must come after function and utilitarian requirements have been met. One of the reasons I love making pottery is that it’s dependent on the convergence of science and art. Maybe that’s another way to define what craft is. Despite this convergence, most of my time in the studio right now is focused mostly on science and less on art. This reality led me to recall another quote that I had read in a book that stuck with about art and science, form and function, style and utility, but I couldn’t remember where I had read it. After a few days of searching through my library for the quote, I found it buried in the preface to a book by the author, Daniel Rhodes (photo, below). He shared that, “While technical information must not be considered as an end to itself, it is a necessary prerequisite to a free and creative choice of means in ceramics”. More support for where I find myself right now. With form following function and the need for technical information as a prerequisite to creativity, I felt I might be on to something. I left Vermont to go to college and study ceramics in 1970. The year before, I read the book that included the quote by Rhodes. His book, also known as the Potter’s Bible, Clay and Glazes for Potter, (image of my copy below) was packed with technical information (okay, very packed and it was all in black and white, even the photos). I loved the book mostly because Rhodes was considered one of the top ceramics experts in the world at the time. Rhodes, along with Val Cushing were the two anchors in the ceramics program at Alfred University, considered one of the best ceramics programs in the country. I let my imagination run wild thinking about what it would be like to work with him. I thought if I read his book it might provide me some good karma during the college application process and once I was accepted, I would be that much more ahead of others when school started. Perhaps I could even refer to passages from the book during classes with Rhodes. Something like, Professor Rhodes, I recall on page 73, you offer that feldspar is one of the most important glaze materials. Is that because… as I said, I let my imagination run. I applied to three art schools that had ceramics programs- Alfred, Syracuse University and Rochester Institute of Technology’s School for American Craftsmen. I opted not to apply to Rhode Island School of Design as I decided it was too big a stretch and my perception of it was it was more art and less craft. The short version is that I wasn’t accepted at Alfred or Syracuse and was waited listed at RIT. That meant not only was the future collaboration between Daniel Rhodes and me not going to happen, I didn’t have a college to go to in the fall. As a result, the last half of my senior year was a pretty dark time and it stayed that way until early summer when I received an acceptance letter from RIT letting me know that I was to join seven others to form the ceramics program’s freshmen class in the fall. While I never did meet Daniel Rhodes, his quote about learning as much technical knowledge first before trying to engage fully in creativity is to me about recognizing the importance of digging deeply into the science of ceramics and letting that inform and perhaps even define the art. I don’t recall discussing Rhode’s specific quote with my classmates, but I’m certain his argument would not have been embraced by some of new friends. In fact, during discussions, some argued that creativity has to come first and it actually informs or in some cases dictates the need for science and technical knowledge. 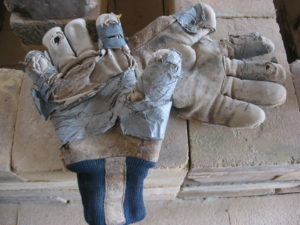 They wanted to be cut loose in the clay studio and create, build, form and experience clay. Interestingly, what they sometimes created was, in my opinion, not great to look at and technically questionable. Maybe I’m being too critical here, but many times after the results of their creative frenzies dried, embellishments and additions fell off and glazes failed. Even then, some argued that the results were all part of making art and integral to the process. Most, however, came to realize that Rhodes advice was right and having a grasp of technique and understanding of earth science, chemistry and physics added a whole lot to them achieving forms that were, in the end, great to look at and stayed together all the way through firing. During the past four months of spending more time in my studio, I’ve been thinking a lot about form, but focusing mostly on technique in selecting the right clay body, throwing on the wheel, carefully analyzing my glazes and firing the new kiln so I can count on it to yield consistent results, which I’m still looking forward to. There’s a lot of technical stuff to learn, sometimes more than I think I’ll have time to learn. I realize that if I wait to completely conquer technique before tackling form and style, I’ll be pushing a walker or worse. I want my pieces to be technically good and have strong form so I’ll need to work on both at the same time. I don’t think Sullivan or Rhodes would have a problem with that. Don Reitz came to RIT while I was a student and spent a couple of days demonstrating, meeting with us and talking about his work. I hadn’t heard of him back then and assumed he was going to share some tips and techniques for making functional pots. I could not have been more wrong. His work is best described as ceramic structures with thrown pieces, additions, applications, texture and other decorations applied. Watching him work was more like performance art with precision movement, flare, humor and spontaneity. The thrown bases he started with were thick and massive, forming the foundation for additional collars, cylinders and add-ons. His pieces were highly stylized, beautifully formed and technically very good. Could he have created the forms he did if he lacked deep understanding of the technical aspects of ceramics? Probably not. Reading about his trajectory as a potter, I learned that he started like most potters by making traditional, functional pots and then evolved, technically and stylistically, from there. At what point in his evolution did he sit down, looked at his mugs, and wondered if they were an accurate reflection of himself? Thinking more about my mugs, I’ve decided that their form and my unique style will come naturally, evolve and grow over time. That said, I go from my house to my studio almost every day with a sense of urgency and patience. There’s urgency because I’m not taking my morning walks as an eighteen year old and patience because as much as I want my pots to reflect who I am, I need them to be functional, of use to others and technically solid. At the same time, if my pots are only functional and lacking in style and form, why would someone want them? 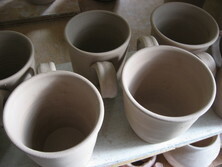 Turning again to my freshly made row of mugs, I have to agree with my earlier assessment, they look okay. For now, they are, and I am, where we need to be.